Today I’m thrilled to have Dave Munson on the show. Dave is the founder of Saddleback Leather which is a company that sells indestructible leather bags. I’m actually quite familiar with the Saddleback Leather story. In fact, I even used his company as a case study in my create a profitable online store course on how to create a great unique value proposition for your products. Even though Dave’s company sells leather bags which is a commodity product that is highly competitive, Dave has created an incredibly profitable business selling bags by standing out in a competitive niche. Steve: You are listening to the My Wife Quit her Job Podcast, the place where I bring on successful bootstrapped business owners and delve deeply into what strategies are working and what strategies are not. 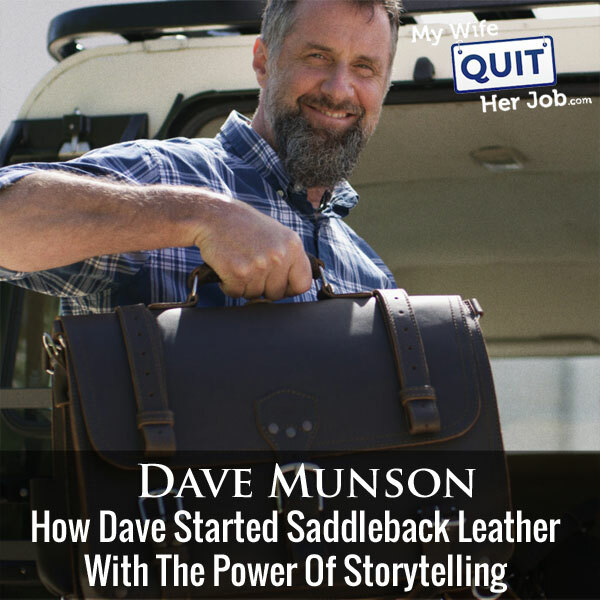 Now today I’m thrilled to have Dave Munson of Saddleback Leather on the show. Now Saddleback Leather sells leather bags, and way back in 2011 when I first launched my e-commerce course, I actually used Saddleback Leather as a perfect example of how to sell a product in a competitive niche by having a great value proposition. I know you’ll love this episode. But before we begin, I want to give a shout out to Klaviyo who is also a sponsor of the show. Now I’m super excited to talk about Klaviyo because they are the email marketing platform that I personally use for my ecommerce store, and I actually depend on them for over 20% of my revenues. Now Klaviyo is the only email platform out there that is specifically built for ecommerce stores, and here is why it’s so powerful. Klaviyo can track every single customer who has shopped in your store and exactly what they bought, and that allows you to do many things. So let’s say I want to send an email out to everyone who purchased a red handkerchief in the last week, easy. Let’s say I want to set up a special auto-responder sequence to my customers depending on what they bought, piece of cake, and there is full revenue tracking on every single email. Now I also wanted to give a shout out to my other sponsor Seller Labs, and specifically I want to talk about their awesome Amazon tool, Scope. Now I’m really excited about Scope as well because Scope actually increased my Amazon sales on several listings by 39% within the first week of use, crazy, right? Now, what does this tool do that could possibly boost my sales so quickly? Well, quite simply, Scope tells you what keywords are driving sales on Amazon. So here is what I did, I searched Amazon and I found the bestselling product listings in my niche, then I used Scope to tell me exactly what keywords those bestselling listings were using to generate sales. I added these keywords to my own Amazon listings and my sales picked up immediately. So today I use Scope for all my Amazon products to find high converting keywords in the back end as well as for my Amazon advertising campaigns. So in short, Scope can boost your Amazon sales almost immediately like they did for mine, and 39% is nothing to sneeze at. Right now if you go to Sellerlabs.com/wife, you can check out Scope for free, and if you decide to sign up, you’ll get $50 off of any plan. Once again that’s Sellerlabs.com/wife, now on to the show. Steve: Welcome to the My Wife Quit her Job Podcast. Today I’m thrilled to have Dave Munson on the show. Now Dave is the founder of Saddleback Leather, which is a company that sells indestructible leather bags. Now I normally don’t interview anyone who I’ve actually haven’t met, but Dave is different because I am quite familiar with the Saddleback Leather story, and in fact I even used his company as a case study in my create a profitable online store course on how to create a great unique value proposition for your products. So here’s the thing, Dave’s company sells leather bags which by most standards is a commodity product that is highly competitive. But Dave has created an incredibly profitable business selling bags. So I invited him to come on the podcast today to talk about his story, and how to make your company truly stand out in a competitive niche. And with that, welcome to the show Dave, how are you doing today man? Dave: I am doing great, thanks for having me on Steve, I appreciate that. Steve: Yeah, really happy to have you especially since I’ve actually kind of analyzed your company over the years, so it’s great to actually be able to speak to you mano-e-mano. So give us a quick background story. I know the story for Saddleback Leather is great; I wanted you to tell the story to the listeners though about how you came up with the idea of selling leather bags, and what your value proposition is? Dave: Okay, so back in 1999, I was kind of like, I don’t know, what do I do, what should I do? I was 28 years old, I was like, what should I do? And I — someone said hey, would you volunteer to teach English sound in this little school in Mexico? I was, yeah that sounds cool, I’ll do that. And so I moved to Mexico, and way down south, and I taught English for a year. And while I was there, I was looking for a bag. I had this bag in my head; it’s like something like Indiana Jones would carry. And so I was looking around, I looked around for it, I couldn’t find one, but I found a guy making bags. And so I sketched it out, he made it for me. And everywhere I went, people would say, oh my gosh, where did you get that bag, that is gorgeous. I went back up to the states, to Portland, Oregon where I’m from, and man it was constant, four or five times a day, bankers and people coming out of their offices as I walked by were like, “Excuse me sir, where can I get one of those?” And I thought, huh, and I’d always been a youth worker, I always work with youth. And so that, I was like, hey this could — this I could do it for free, and I just sell some of these bags, that would be cool. And so I went back down to Mexico, I had been selling real estate, I had a – Federalist [ph] sent to kill me for something. It was like, I fought a bull in a bull fight, you know what, all this stuff in Mexico is really cool, and not always comfortable, but it was really cool. And I ended up in Juarez Mexico, right across the border from El Paso Texas, and just me and my black lab blue, we just slept on the floor of this $100 a month apartment, no hot water for three years, and yeah that was kind of sucky. That was kind of rough. But all the money that I was making, I would send money, I put money into his bank account in Juarez, and this father and son were way, way further south. They would send up three or four bags on the bus. I would go to the bus station in Juarez, I’d take the bags over to El Paso, and I used — a friend of mine has a mechanic shop, and I’d use his internet to surf at night, and I would sell on eBay. And so I’d sell a bag or two here and there, and then I would sell them, and then I would deposit the money into the bank account that this father and son and I would – I would buy seven bags, and then 12 bags, and then 14 bags, and then I’d buy dog food again, and pay rent and stuff. And then I would start with six bags again, and then 12 bags, and pretty soon I got to where, yeah he couldn’t keep up anymore. Around that time, it’s 2006, I was in Panama with my brother, and I stopped and see how the auctions were doing, and they went to like $710 for two bags, and then the second chance offer to the third person was for 705. Steve: Sorry, this is on eBay or? Dave: Yeah it was eBay, yeah. Dave: And my dad was sending the bags out while we were down there, and I was like I just made $2,125 while I’m in Panama, are you kidding me, that is awesome. So I was like, man I think I’m really on to something. And just after that, like seriously I clicked out of that, went to My Space, and this is 2006, and very beginning of 2006. And there was this really pretty girl who was asking me about — she’s like where is the phone number of Bible College where I went to school. And I was like, wow she’s pretty, so I read her profile, we had a whole lot in common, got back, I went to visit her, started kissing, the next thing you know, we’re married like five months later. And yeah, so then we started our factory down there in 2008, and because the other people couldn’t keep up with the production. So we started our own, people don’t care about quality of your stuff as much as you do, nobody does. So I started our own factory, and yeah [overlapping 00:09:07]. Steve: Can we talk about that for a minute, like you went from a single Mexican craftsman to a factory. How does that happen exactly? How much did you pay to like start your factory? It just sounds really intimidating actually to me. Dave: Well, this restaurant that my wife and I like to go to had this Dutch guy that was managing it, and real likeable guy, sparkly eyes, you know real doer, we really liked the guy. So I said, hey Renee, if we start this factory, you know we want to do it, do you think you can find some people. So we invested about $60,000 in machinery and rent and renovating this place, and he went over to the Dooney & Bourke factory where they make Dooney & Bourke purses, and he just — if the sheep were too skinny, then I’ll buy them over to my pastor. So they would pay them a little bit more and we got some of their — we got about 14 of their very best. I mean the grass is greener and if they can fit through the fence because they’re so skinny, then ah. So we brought him over, and we got another name, spent time with them, and Renee bought our business name. He got us going, got us really strong, and he’s still with us today. Steve: What were your sales like at that point, just curious? Dave: When I got married we were at 75,000, I think I’d sold 74 – in 2,000 like $74,000 or $75,000 that year. Dave: And you know cost of goods was probably half that or something like that. I didn’t have a lot of overhead, it was just my dad shipping stuff, and my sister was doing some customer service, and I was doing everything else. Steve: And that’s actually when you decided to start your own website as well? Dave: Yeah, a friend of mine from church said, hey Dave, you need a website man. So like 2004 I think, he was like you really seriously Dave you need a website. And so you got to think of a name, because I was just selling these bags with no names on them. And I wrote my story out of what I was doing and stuff, blew it nicely on the floor travel around Mexico in my old Land Cruiser, a really old Land Cruiser, and we’d sleep on the rack and blue would run and jump up onto the hood, and he’d jump up onto the rack, and we’d sleep up there you know behind some gas station or somewhere. And people liked to just say man and his dog just trying to travel around, an. I didn’t know, I was like, I thought it was just kind of normal. Steve: Did you know anything about leather before starting this company? Dave: I knew that it smelt really good. Steve: Okay, so here’s the thing for the listeners out there, like Dave has all these videos on his site that emphasize the quality of his bags. And you come across as supremely knowledgeable about leather and craftsmanship, and I guess that just picked up over time. So you had none of this knowledge before you started right? Dave: I knew nothing, I would go to Wilson’s Leather in the mall, and I would go in there and like tell them, oh it smells so good in here, like that’s all I knew about leather was just it smells really good. But here’s what happened, so I took a tour of the factory, and I just started asking a lot of questions. And so what I tell people, if you’re going to get into something, become an expert, I mean an expert in what you’re doing. So like I went into to go into Australia once to find out about kangaroo leather, and they use it for like high end motorcycle racing, and suits and shifty boots in Porsche and high end soccer shoes. I was like; okay what is it about kangaroo skin? So the guy was telling me at the tannery, and I go, no I want to know — and we don’t use kangaroo, but I wanted to know about it. So he goes, okay in a molecular level, all of the fibers grow at a 45 degree angle to each other in like 3D, all different directions, and they weave together, and that’s why it’s flexible, and that’s why it’s so strong. I was like, oh that’s what I needed to know is — and you can split it, you can split kangaroo leather in haves like lengthwise, like horizontally, and the bottom half is equally as strong as the top half. I was like, oh that’s wonderful stuff to know. And if you do like irregular hide, if you split it in half so it’s like one millimeter on top, one millimeter on the bottom, the top half has all the really tough fibers all kind of woven together, and the bottom half has all the flat fibers and it tears easier. And so you just start learning stuff like that, but I always tell people become an expert in your area. Learn all about the tanning process, learn all about different skins, learn all about why they’re like they are and so on and so forth. Steve: So Dave, so you transitioned from eBay to your own site, but eBay already has like a built in audience right, and so I was just curious how you got some of the early sales for your own site. Dave: I’m sorry, what was that again, I missed that last part? Steve: How did you start getting sales for your own site, and not taking advantage of eBay’s audience, like when you started your own site, you have no audience, you know traffic, right? So how did you get some of your early sales? Dave: Oh so what I would do is really was word of mouth. People were just talking about it. I started off the site, or I started on eBay and then I would mention my website. This is just one of the bags we have, but I hope you like it, and people go, oh they have other bags, and so they look at the name, they go to Saddlebackleather.com, and come over to our site. So then we started having people talk about us. One of the big things I would do is I would do — like I did a You Tube video in Australia with a crocodile, I was doing a tug of war with the crocodile with my back. And then on our honeymoon we did this — we went on to Bora Bora for our honeymoon, and super duper cool place, and we went scuba diving. And so we go down there and there were sharks all over the place, and as we stuffed the bag full of like fish guts, and we took it down like 60 feet down, and we set it there, and all these fish were just swarming all over it. And so and the sharks were swimming around, we got some great pictures and great video of that. So we just started doing — and that was in 2006, I posted both of those and YouTube had only opened, man, I think a year earlier or something like that. So we were kind of newbies there. But that kind of stuff, crocodile attack, that’s where they just started giving traffic to our site. Steve: So let’s talk about that video. So first of all for the listeners out there, Saddleback Leather’s value proposition is that these bags are indestructible, and what’s your tagline again? Dave: They’ll fight over it when you’re dead. Steve: Right, and so this first video that he was talking about was to demonstrate how indestructible it is by throwing it to sharks. So I’m curious like how did — so these YouTube videos, were people just clicking on like the link underneath the video, or were you just getting type and traffic from people actually seeing your brand on the video and then going to your site that way? Dave: Yeah, I think people were just — you know I don’t know, I just thought was going to post it. So I was just telling my nephew, we were talking, he has a photography business here with us in Fort Worth, and he was saying – we were talking about getting a university or college to put a link on their site for you, and how Google stands up and salutes that. And he said, but yeah but if it’s not on the right page, there’s not a lot of traffic, SEO, blah, blah, blah. I said it’s 100% better than no link. So I say a video with a crocodile attacking the bag or shark swimming around the bag is way better than no video. So actually so I tell people, how do I get my video presence up, or how do I get good at writing blogs, or how do I get – I’m sure you get it all the time, how do I get good at podcasts? Dave: I say the way you get good at these things, the way you get good at photography is by taking a whole lot of pictures. The way you get good at public speaking is by doing a whole lot of public speaking. And you name it, you just have to put the time in. Podcast, how long have you been doing podcasts? Steve: Not that long, three years at this point actually. Dave: Okay, I bet you — well you’re really good at asking questions, and you have a good voice for this, you’ve got a good presence, you seem very at ease. It’s because you did three years of this. Seriously that’s how you do it; you’ve got to put your time in. Kabbage has supported over 100,000 small businesses with over 3.5 billion dollars in funding. So visit Kabbage.com/ wife. There is no cost to apply or to set up your line of credit. And as a My Wife Quit Her Job listener, when you qualify for funding, you will get a $50 visa gift card that you can use anywhere. Now that’s Kabbage with a K, K-A-B-B-A-G-E.com/wife. Once again that’s K-A-B-B-A-G-E.com/wife, now back to the show. And Dave we were talking about this before we hit the record button, but the way you’ve kind of marketed yourself with your unique value proposition is a little bit unconventional, right? So when I think of leather bags, I tend to think of like the Guccis and like the Ferragamos because that’s what my wife is into, but here you have this slogan, they’ll be fighting for it when you are dead. And I’m just curious whether all that, I guess the shock value of that statement was intentional on your marketing, or was it just your sense of humor coming out? Dave: Well, so in 2005, I went around and travelled around Eastern Europe and North Africa just with my bag and my like my briefcase and my suitcase. I was just carrying a cool leather suitcase, and I was — one of my plans was go to Switzerland and buy a gold watch. I wanted to buy — or something with gold. I had like $3,000 I had saved up, and I said I’m going to buy this because I want to hand it down to my grand kids to behold this, that was grandpa’s old watch. And I found that, I was talking about, then people are like, yeah I want something like that to hand down too. Everyone kind of wants to be remembered by or something to that. So I figured, you know why not it be a bag where people go, oh man, that bag has got a million stories, yeah my grandpa’s old bag, it’s really cool, we found it after he died. And this is the desire people have, and so I thought what would go after that? And I told the guy when I made it, I said I just — I don’t want to any breakable parts on it, no zippers, no. I want it to be used after I’m dead. And how do I say that in a one nice little phrase? Yeah, they’ll fight for it when you’re dead, that’s cool. So a lot of these good slogans and stuff, it takes verbally processing with other people. It takes just writing it out, and it took several months to come up with that slogan. Steve: Was that available when you were selling on eBay, I’m just trying to kind of understand how like the evolution of your marketing and your branding went over time? Like when you first listed a bag on eBay, did you have a slogan or were you just literally putting up a bag on eBay? Dave: No, I didn’t even have a name for the company. I was just, hi, anybody who would like to buy one of my bags, they’re really good. Steve: Okay, so how did that evolve to like all these strong value propositions on your site and your slogan, and just the marketing and the branding? Dave: That, you know I don’t know. I just kept thinking this would be cool. I remember laying there in bed one time on the floor, on a mattress on the floor, and I was thinking, wouldn’t it be cool if I like travel around the world and take pictures of my bags, and people would think it was really cool and everything. And I don’t know, it just sort of evolved into that, and now we — but I think the more you put yourself out and put yourself into the brand, the more of who you are comes out. And the way we’re shaped and the way we’re formed by our environment, by what we read, by the people we spend time with, all that shapes us. And so as I started getting into being around leather workers and being around you know these things, man it really — I began to care about quality, and I wanted to teach people because people need to know about quality. And so yeah, it just sort of evolved, it just kept on — so now we do films. Instead of just doing funny looking for a viral hit of you know someone stepping in dog poop or something, yeah it’s funny and many people will say that, we just started doing films and videos about things that we care about. And instead of saying, hey guys we value Juvenile Diabetes Research Foundation, let’s do a video on my niece who has type one diabetes, and what her life’s like. So we did a little film, it made it into everywhere, film festivals, and all the stuff. Or, hey let’s do one about people, about a daycare or a factory, or let’s do one about quality, like what goes into a quality bag and this, and what to watch out for. Let’s do one about – and we share about what we value, and then people look at our stuff and they say, hey I value the same things that that guy does. And without us even saying, hey we value philanthropy, we value people, we value quality, we just share with them. And they kind of gather what we care about. Steve: Do you don’t recommend that all businesses put themselves out there like this? I know some people who start a business, they kind of like to hide behind like a website, or can we redo this all over again, would you perceive the same way? And let’s say you were shy on camera and you didn’t really want to put yourself out there like that, how would you have proceeded? It’s a complicated question I know. Dave: If I were shy, like I’m super not shy. Steve: Yeah you’re not, I see it on videos. Dave: Like I’m the opposite of shy. So I would – you don’t have to put yourself on camera, but you certainly can like do this, you can be the voice of it, or you can people film little things, little educational pieces, you can post blogs about quality. If you have a printing business, you can post and educate people about like the different papers that you want to use, and then make sure that they’re using this kind of ink because this other kind of ink will fade in the sun. So you want to make sure that you don’t have a pink sign, you have a red sign just like you bought three years later. Steve: No that makes sense. And I’m just curious about your marketing strategy. Is making videos and kind of humanizing your company your primary marketing strategy, or do you run a lot of ads, like I’m just trying to get an idea of where most of your sales come from? Dave: Yeah, so it’s interesting, most of our sales for the longest time until recently until the last couple years had come from videos, Facebook being very social, and getting involved in people’s lives, caring about people. And then other people said, I found this cool company, and you got to buy something from them. It doesn’t matter what, just buy something from them. So yeah, most of our business has been just word of mouth, and worked for us. We kind of spur on word of mouth by doing videos. We have a little show called, The Not Dead Yet show, and it’s every week, we’re coming up on episode 50. And, oh actually do 49 here pretty soon today, but we just do film our everyday lives, and but we spend on things that we value, and we don’t have very many people watch it, just kind of a little thing we do with our kids and my wife, see I got a super cool wife by the way, seriously. Eleven different women call my wife their best friend, and I sleep with her, it’s great, but anyway yeah. Steve: How do you attribute like your sales, I was just kind of curious, like how do you attribute the sales to the videos? Like usually when — like for me like before I’m going to undertake something, like I kind of want to know whether that’s going to have a positive effect. And so when you produce a video, how do you know — do you know ahead of time that that’s going to drive traffic to your site which will lead to sales, or is it just something that you put out there and over time you can’t really quite put a finger on it, but in the back your mind you know that it’s doing something? Dave: That’s exactly it, so on the videos you know or how to knock off a bag video we’ve had like 540,000 views of it. When I was putting the other, I was just educating people, and so if I only did things based on our ROI, I would be living in my mother’s basement. Not all the time, but for me that’s what would have happened with my company. So I was doing stuff that I just felt like it was a good idea, and it will pay off. So we never had a video, besides the crocodile attacking the bag video, we never had a video that really had more than ten or 20,000 views. And number 223 was how to knock off a bag video. And we looked at it, we were like, okay what is it about it that people really like? And since then we’ve had several videos that have had 60,000, 160,000, 280,000 views on them. And because the way you get good at doing videos is doing videos, but here’s the thing, here’s something that happened because of, The Not Dead Yet video. Of course right away we had like 350,000 views or something like that, 300,000 views. Steve: Where are these views coming from, are they just subscribers, or are you sending them an e-mail to check out the video? Dave: No, people were posting on other websites. Like, oh my gosh, you guys, this bags company, in all these different places, or you have got to see this video, this is great, They’re going on and on about the video, and I even got an e-mail from Seth Godin, and he said, hey, nice job on the video. Dave: I was like, wow, that was cool. But then a year later Kai Ryssdal from Marketplace, NPR with eight million listeners every week, he got a hold of me and said, hey, we want to interview you about this video, how to knock off a bag. And so that just — they just — it’s the gift that just keeps on giving that way there still. But you can’t expect to have any kind of great video. Don’t go for a viral video. And so what I say is like let’s say you have a field, and you’re out in the field and it’s like 15 degrees Fahrenheit, it’s just cold in the field. Say you brought a fire, you know regular size camp fire, it’s warm around it, but if you get away from it you know — so the way to warm up the field is to have — what if you had like 250 fires going in the field all spaced out, it would be nice and toasty warm, you could wear flip flops and sandals and a t-top. So that’s what you’re after, I believe that’s what you’re after. Don’t go after the viral videos, go after educating people, go after sharing what you value. Go up for quality, and let that out there, and those, each one of those is a little fire that keeps your business really warm. Steve: Dave, this sounds a lot like blogging and podcasting to be honest with you, like you put out content, and you’re not sure where it’s going to go, but if you continue to do it on a consistent basis, like I’ve been blogging for eight years now, and over that time you know some of them will be hits, some of them won’t, and the important thing is just the consistency of putting stuff out there, and putting your name out there. Dave: Yeah exactly, we have this Not Dead Yet show. And you know all these episodes we’ve done, and all over the world we’ve done little bits and pieces from different places. And we have we have like 2,200 people watch it, or 1,100 or 4,200 people watch these little videos, and it takes a while. But I promise you, it’s going to lead to something, it will lead. In fact we had — now come to think of it — going into it, we had a news anchor here in Fort Worth on CBS. He was looking for a briefcase, he went to our Facebook page, he saw the Not Dead Yet show, watched it, and he saw this tent that we were putting up, and we live in tents out in the country, but they’re like super cool tents like it’s kind of hard to explain. But he saw that and he was like, oh my gosh, we have to do an episode on you. So they sent the film crew out, they did this episode of us and these tents that we were moving into, and we had — and that was probably worth $200,000 in sales. Dave: So you don’t know where it’s going to go. And then we had someone approaches two different people; they saw our shows and said, I want to have — would you guys do a reality show. And I couldn’t at the time, I put those on hold, it was last year, I just have other things more important. But see it leads to stuff, and people are like, dude, what are you doing, you waste all this money doing these, and all this time? And I go, I don’t know, but I promise you something good is going to come of it. And I don’t know, but something good is going to come of it, I don’t know. Steve: Yea, I think a bit like lottery tickets, like every time you put something out there, it’s like another lottery ticket, and if you have enough out there, pretty soon you’re going to win the lottery or the jackpot. Steve: Let’s talk about some other things, so we mentioned word of mouth is the majority of your business, are you guys doing any other sort of marketing as well? Dave: Yes, we do we do Google AdWords, and actually we’ve gotten — we started out the business all like 100% word of mouth. We didn’t spend money on marketing for the first until like 2012 I think is the first time we spent money on anything else, any kind of marketing. From 2003 until 2012, the first nine years we didn’t spend — that I can think of, we didn’t spend any money on marketing. Dave: Well, I paid this guy in Jamaica $200 for our briefcases to turn into backpacks, and so I paid him $200 to film. He had dreadlocks, he was super cool looking guy, really nice guy, and I filmed with him all day, and I gave him $200 to have him demonstrating how to put it on, how to make it into a backpack. Other than that really yeah, I didn’t really spend any money. Steve: So AdWords, are you doing any Facebook ads at all or? Dave: Yeah so now we do Facebook ads, we’re doing Amazon, we sell an Amazon, that’s about — I think it’s about 8% of our business. Steve: Let’s talk about Amazon a little bit because it’s hard to kind of put your brand and your value proposition out there on Amazon, right? And so the people that find you on Amazon, do they — and you probably don’t know this for sure, but do they already know your brand, or do they just think of you a just another handbag company, or a bag company? Dave: Yeah, I think they just think of us as just another bag company. Yeah but we get a ton of traffic from Amazon to our website. So now our trick, our what we try to do is to keep them from buying on Amazon, and get them to buy from our website, because we don’t want to pay that 15 or 30%, whatever the number is that Amazon charges. So if we can get them to stay on our website, I mean all the better. Dave: So how do you get people to come on your website from Amazon? Dave: Oh well, we’ll say this is some of the stuff we have. Steve: Okay, is that in the bullet points you mean? Dave: Yeah, well, I get to look now what we have now, but we would strongly allude to we have a whole lot of other stuff elsewhere. And so yeah we’ve got a — we’re right now, my brother just took over Amazon and he has his own business too in Amazon, stuff for other people, and he had grown like super huge. And so he just took over our Amazon, and I know they don’t do the reviews where you get all those people to review your stuff for cheap, and they don’t do that stuff anymore. So yeah we’re right now we’re working with doing a fulfillment by Amazon, and with a lot of our smaller pieces. We don’t want to put all of our big pieces in there. It’s too expensive for the storage and the fees, and that sort of thing. We have suitcases, we have some really big duffel bags and stuff, we’re not supper about shipping. So we’ve chosen the product line to send there, but also in there we’re going to — you can’t put a link to your website or anything. Dave: But we do want to have, you register your bag. We want to have, we’re going to be having when you register your bag, you get this key chain that has like the letter S on it, it’s one of the — it’s not the A or the D or the L or the E or the B or the C or the K, but it’s the S. And when you register your bag, you get that key chain, that sort of thing. So we ultimately we want them to come back and buy off of our website. So that implies that not all of your items are on Amazon, right? Steve: Okay, how do you pick and choose which ones you want to list on there? Dave: Well, we go best sellers. We don’t want to have too much of a selection on there. If there’s too much of a selection, then people don’t choose at all. So we just — we’ve learned that the hard way, but so we’re narrowing down to just one size and these are best sellers of our briefcases, and the best sellers of our wallets. We’re not going to have all of the wallets on there. And most people just — I’m guessing they just buy off of Amazon. Steve: There are some people that are like that yeah, I was just kind of curious yeah. Dave: And here’s something I was thinking about, people I don’t think they go to Amazon or go to the website or internet, I’m looking for a briefcase that like everyone’s going to compliment me on or be part of this for Turtle Club, and all the people high five me and I’ll get the job because my interviewer liked my bag, and I’ll win the case because the judge liked my briefcase. We hear all these stories all the time. And people aren’t looking for that, so they’re just going. They are not looking for what’s the best briefcase in the whole world, or what’s the most masculine briefcase there is out there? They’re just looking for something to carry their stuff. That’s what they’re looking for. So that’s why they were – they are not asking their friends even, hey what kind of briefcase should I buy? They just go to either Google images or Google Shopping or they go to Amazon. And they look for stuff. And then they fall in love with it and we get them to fall in love with it. Steve: I mean it’s very easy to fall in love with your products, and I just – I encourage actually anyone who’s listening to this to go to Saddleback Leather, and I challenge you not to like their products, because David does such a good job of showing the quality and the care and the class that goes into every bag. I mean it’s crazy, I mean you have to go there and actually believe what I’m talking about. Dave: Well, one of the things that we found — I just felt like instead of — I don’t want to dog another company, there are a lot of really good companies out there, and no one likes it when you insult and slam other companies. And so I just — what I do is I highlight what we do, and the quality that goes into it. I teach them, make sure that your hardware is like this, make sure that it’s polyester thread not nylon, make sure — and then people trust you. So the more you educate people on whatever service you’re doing or whatever — if you install gates and fences, ensure that people understand what goes into a good quote, what goes into a good fence, how deep do you put the posts. And then it can — first of all they search trust in you, and second of all they go, I wonder if that guy does it, or is he going to be sneaky, or do I have to be out there all the time checking to see if you went down two feet on my yard. I wonder if the new soil is five inches deep, or if he just spread and put new soil on top of the old. I wonder, and they start questioning everyone around you, and then they just go, it’s not worth it, I’ll just buy from this guy. Steve: That’s ingenious, like I can’t even think of that many companies that do that to be honest with you, it’s actually rare surprisingly. Dave: I’m glad there aren’t, this is free more. Steve: No I’m just thinking about handbags, I’m just thinking about your niche right now, and I can’t really think of very many companies that do that, it’s like an aha moment right now, it’s crazy. Dave: Yeah, that’s very good. Steve: And I’ll probably take this in the context of my own store being very selfish here, I could very easily talk about our personalization process, the care with how we deal with the items and packaging and everything, just like that. And that would instantly give us more credibility, and cause everyone else to question the other companies that are doing what we’re doing. Dave: No absolutely, and I always say to quality, just go after quality, because you can’t compete with China on price, that is just a race to the bottom, but they can’t compete with you on quality. Now, they do quality things in China, there are people who make wonderful craftsman there, and the people are just like — seriously I’ve heard they’re super relational and really sweet, sweet, sweet people, but there’s such pressure for making money and at whatever the cost that you just kind of question. We had some hardware made in China once, and it was nickel plated brass hardware. Brass is 70% copper and 30% zinc. So we got it, and their definition of copper wasn’t our definition of copper according to the American test standard measure, ATSM or whatever that is. And the hardware started falling apart, it started like the dealing would rub against the class for the shoulder strap, and it just would wear through in like a month, it cost us so much money to repair all of those. But we had it tested; it was like 34% copper instead of 70% copper. Steve: I see, where do you guys source your stuff from, like how do you ensure quality for your own stuff? Dave: Oh, we do our own inspections, we send stuff to laboratories with random inspections, government laboratory, we have our factories in Mexico, and so there’s a place called CA Tech just down the road, it’s a government laboratory. And we will drop off hardware; have them give us the report of what the hardware is made of. Steve: Where do you source the materials from like both the leather and the rivets and the hardware? Dave: Yeah it’s mainly local. We have a tannery in this town called Laon [ph], and it’s right kind of central Mexico, it’s really a pretty place, and it’s kind of the leather capital. So we’ve learned like two tanneries that we want to work with, and one tannery is — they voluntarily submitted themselves to be inspected by this British company — British kind of the head of all leather for the world, and these guys come in and we’ll check their break rooms, and they’ll check the dressing rooms and the bathroom, make sure they’re clean, they want to make sure their employees are being treated right, that they have a water treatment plant, they’re checking their chemicals randomly, they’re inspecting the leather, and they just fly in and just take stuff and sample it. And so they won tannery of the year one of the years for North and South America, and another year they came in second to the red wing tannery up in Minnesota, but that’s out of even Brazil or Argentina, they came in second out of hundreds of tanneries. So we do business with them, they love their people, they really care for them. They are just a good solid tannery. Steve: So it seems like all materials and everything that you do is the highest quality, and so does that affect your margins, I mean you have to be priced higher to afford this, right, and so do you ever run into problems where people just want like the cheap stuff? Dave: Oh they’ll come see us next year when their bag is all crappy. I ran into a guy in the airport once, and from a distance I said, hey that’s a nice briefcase. And he looks at me, you wait in line at a restaurant, and he is like, oh thanks. And I walked over to him, I was like, hey where did you hear about Saddleback Leather. And he goes, who? I looked at us like oh that’s a knockoff bag. So I go, oh this is Saddleback, and he goes, no. I say, where did you get it? He said, oh I got it on the internet somewhere. And I said, well, I’m glad that at least you like my design. So those guys, they all come back when their bag wears out. Some of the bags are like the people knocking off our stuff. They sell their bags at the cost of my raw materials. I mean like or they sell them at less than the cost, the price of my raw materials, and people are embarrassed, yeah I couldn’t afford one. Dude, I understand that, I’ve been there, but save up. Steve: Right, okay so it hasn’t really like all these knock offs hasn’t really affected your business much, which is kind of where I was getting at? Dave: You know what, when you educate, when you’re first in the market, when you’re high, high, high quality, they can’t compete with you, it’s just, they just can’t. I mean of course yeah I’m sure we lost some sales. I lost that guy, I ran across two other knock offs. But those are the exceptions. I’m not going to worry about those guys; I will put my head down and keep doing the right thing. Steve: That was my next question, do you have to try and go after these people, and it sounds like no. Dave: No, I just put my head down, and I just work really hard. A company, some lawyers in Chicago said, because the guy I had when I first — the father and son in Mexico couldn’t keep up the production. So when my wife and I got married, we moved to Mexico, and I found a small factory to make my stuff. Well, then we started our own factory like a year and a half later, but in the meantime — or after we started our factory he started the website called SaddlebackLeather.us, and he was selling my bags, because he knew how to make them. And so I talked to this lawyer in Chicago and the guy said, yeah, I’ll talk to my partners, we can take care of that guy for $410,000, and we’ll get him to stop selling. And I was like, man, hit men are a lot cheaper than that. No, I said, no thanks, I’m not going to do that. So I went to Carlo, and I said Carlo, I’m going to tell your dad if you don’t stop making my bags, it’s a disgrace what you’re doing, and I knew his dad. And he was like, okay, okay, okay, I’ll stop. But I just put my head down, and those guys will go out a bit since. They will. Dave: So Dave, we’ve been chatting for a little bit, and I did want to get your opinion because I get this question all the time. I have people that come to me and they say, hey Steve I would like to sell such and such, like baby clothes or wedding favors, or something like that, things that are really competitive and pretty commoditized. And I would actually categorize leather bags in that category, right? So what advice would you give people, who are trying to sell something that’s highly competitive, if you were to start all over again? Dave: Yeah, I would say, again I would say personalize it, because if they see you and your wife and your little baby selling baby clothes and you’re like, you know what is this little Mom & Pop saying and it’s new to us, we just love it, and we found there was a lot of baby clothes out here that we really like for our kids that were soft enough, or whatever it is. And so we found this group and oh out of Spain, they’re just fantastic, and anyway we’d love for you to buy from us, you know something and I’m just making that up right now, baby clothes what you said. But people want nice people to succeed. And if they have a choice between some corporation, you know Saddleback Leather cot, or Dave and Susan and their family, who do they buy from? They’re going to buy from us. So I would say make it personable, be yourself, and if you’re not a nice person then don’t. Do videos, I would say do videos, put it out there. I would say, yeah I would say do videos and put them out there, and show yourself, reveal yourself, be transparent in it. And I would say that you’d be surprised how many people are going to want to — like oh, I hope one day I can have lunch with them, just because they think you’re a celebrity because you do videos. So I would say make it really authentic, but put yourself, personalize your company. So when they do go from Amazon to your website to check it, or whatever it is, if you do party favors, I don’t know if they do that, but yeah, I would say know all those, and know about party favors. And maybe have some sort of a custom party favor. Think of how you can improve it, or do bundling, you know we’ll sell not only paper maché, but we will you know rolls, but we will also throw in there a roll of tape also. And yeah, I would say start over, but above all things I would say be generous with people. Just take that, just be generous with people even in your personal life, be generous with people. Steve: Well, that’s great advice Dave, and I really appreciate your time, and I’m actually probably going to go out and start documenting our processes and how we actually take care in stitching out our products now after talking with you. So I think that’s great advice, and it’s almost like, why didn’t I think of that earlier. Thanks a lot Dave for coming on the show, really appreciate all your advice. If anyone wants to get ahold of you, or if they have any other questions, where can they find you? Dave: Yeah, Dave@SaddlebackLeather. And they can go there or Dave@SaddlebackLeather. Steve: Okay, all right then, thanks a lot for coming on the show Dave, really appreciate it. Dave: Hey, it was good talking with you, take care. Hope you enjoyed that episode. I’ve actually known about Saddleback Leather for quite some time now, and I really admire Dave’s approach to business, and it’s a model that everyone should follow. For more information about this episode, go to mywifequitherjob.com/episode181. Now, I talk about how I use all these tools on my blog, and if you’re interested in starting your own ecommerce store, head on over to mywifequitherjob.com and sign up for my free six day mini course. Just type in your email, and I’ll send you the course right away, thanks for listening.